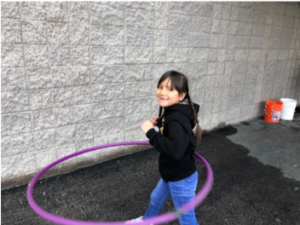 During the week of February 18, 2019, Nevada Medical Center, in partnership with Playworks and the UNLV School of Public Health, facilitated a week-long Recess Reboot at Robert Lunt Elementary School. School leaders, staff, students, and the identified recess team spent the week learning how to re-connect with students during recess. Recess reboot helps educators rethink playtime and restore the belief that play is a basic human need. Kids who play are more resilient, active, and empathetic. Through play, kids learn how to make friends, gain confidence, solve problems, and be part of a team. They learn the social and emotional learning skills that will be rehearsed in classrooms, board rooms, and throughout their lives. Due to the incredible generosity of Drs. Florence & Gard Jameson, the students and staff of Robert Lunt Elementary School received the gift of play!